Queer Reads Library (QRL) is a mobile collection of books and independently published zines centered around queer subjectivity. We also collaborate with activists, archivists and artists to host programs. Our team is Beatrix Pang, myself (co-founders) and artist-writer Rachel Lau. Follow our Instagram for updates and read about QRL on Still / Loud, Artforum, The Paris Review and Harper’s Bazaar (HK). QRL at CultureFest organized by Plug Magazine, October 6 - 7, 2018. 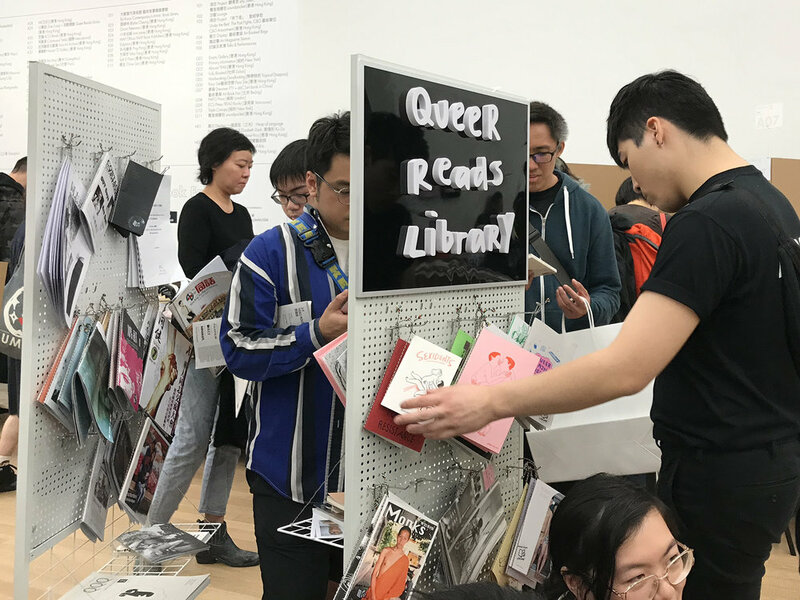 Queer Reads Picnic at Art After Hours, Tai Kwun Contemporary, October 19, 2018. Mini QRL display with Zine Coop at art book in China, November 2 - 4, 2018. QRL at Migrants’ Pride, with artist/writer El Lee, November 18, 2018. Queer Reads Dialogue with activist and collector Connie Chan and zine expert Ranee Ng at Eaton, November 19, 2018. QRL Exhibition including 1990s Hong Kong zines from the collection of Connie Chan. In partnership with Eaton Workshop as part of the Human/Progress Festival, November 17, 2018 - January 7, 2019. QRL at Tai Kok Tsui Zine Fest, Bedroom, December 6, 2018. QRL at Booked, Hong Kong’s first international art book fair organized by Tai Kwun Contemporary, January 11 - 13, 2019. QRL photobook display at 8edroom zine fair organized by Bedroom and 8-Ball Community, February 23 - 25, 2019. Dialogue with Gabriel Cheung of Small Potatoes Press, moderated by Eugene from Maekan. QRL at the third Hong Kong Queer Literary and Culture Festival, March 29 - 31, 2019.
and our friend Veronica Sanchis of Foto Féminas who we invited to create a mobile human library.